The creation of Kentucky Lake in the 1940s put a lot of things underwater. Farms, homes, businesses, roads, railroads, cemeteries and entire communities. Danville, Tennessee was one of the communities that permanently flooded when the Tennessee River was impounded to create Kentucky Lake. 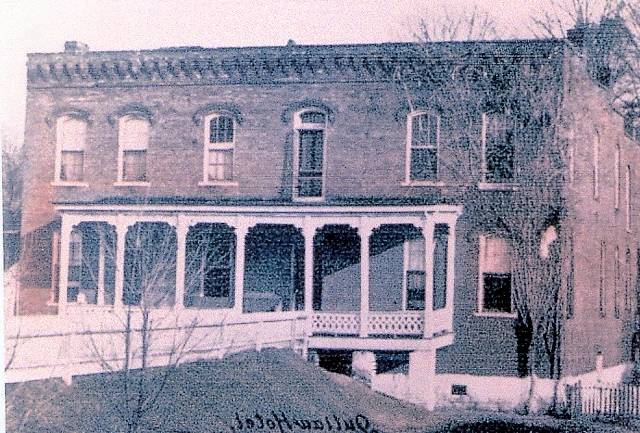 The former site of Danville is located near present-day McKinnon. The story of Danville is unique with the fact that two large structures of the former town still remain – the abandoned and partially removed L&N Railroad bridge and the transfer elevator. Danville was born around 1860 during the construction and completion of the L&N Railroad at the site. A large bridge was constructed across the Tennessee River to carry trains running from Paris to Clarksville. This was a very important freight route and strategic to the south. During the Civil War, Union troops seized the bridge and guarded it, and disabled it at one point to prevent trains from delivering supplies for the south. The number of people living in Danville was about 150 in 1878. A hotel was built at the site called Outlaw Hotel named after George W. Outlaw. Other businesses included a general store, grocery, a drug store, a doctor’s office, a sawmill, and two saloons. A Methodist Episcopal and a Cumberland Presbyterian church was located there as well. The hotel located at Danville. A railroad spur was built in 1887 from Danville to a tiny community six miles north called Stribling. The short line was known as the Danville and LaGrange railroad. The purpose of the line was to serve the LaGrange furnace at Stribling. The line was abandoned just after a few years. The entire railroad and area of Stribling is now under Kentucky Lake. In 1914, a transfer elevator with a rail spur was built just south of the L&N Railroad. The large concrete structure was constructed on the banks of the river and allowed cargo ships to transfer goods from the river to the railroad tracks. It was several stories tall to allow the transfer of goods despite the height of the river. Some of the goods transferred included peanuts, grain, coal, mussel shells and general merchandise. 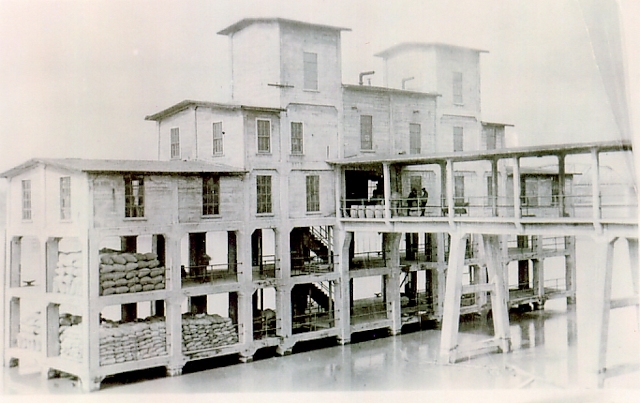 The old Danville Transfer Elevator on the Tennessee River before the creation of Kentucky Lake. It still exists today, but mostly under water. The transfer elevator still exists today. It’s quite a site to see, a large concrete structure in the middle of Kentucky Lake, just south of the old railroad bridge (of which two spans of it remains, the rest is gone). The bridge was replaced in 1931 and took several years to complete due to the complexity of the project. In 1937, the Tennessee Valley Authority began surveying the area for the creation of Kentucky Lake. Around 1940, records indicate that 120 people were living in Danville. In 1943, the post office at Danville was moved a couple miles east to Stewart, Tennessee and the following year the lake flooded the town permanently. With the creation of the lakes, parts of the railroad were relocated to higher ground. You can make out the old line easily with Google’s satellite imagery. Sometime in the mid 1980s, Seaboard Systems, who acquired the railroad, suspended service along the line from Paris to Cumberland City. Three spans of the bridge along with the railroad tracks were removed. Danville was located on the eastern banks of the Tennessee River near present-day McKinnon. Four Rivers Explorer is always a work in progress, including this section. If you have any information you would like to share about Danville, please contact us. Danville’s L&N Railroad Bridge construction photos from the early 1930s.